As a freshman and then again as a sophomore, Brendan Van Voorhis had finished top three at the state track and field meet on relay teams. 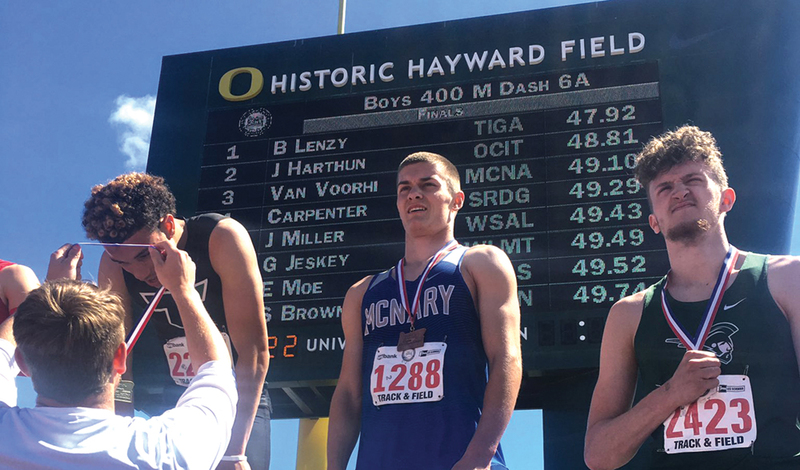 As a senior, Van Voorhis got to feel what it’s like individually, winning a bronze medal in the 400-meter run in 49.10 on Saturday, May 20 at Hayward Field. “It was a good way to end my senior season,” Van Voorhis said. In lane seven after running a 49.82 in prelims, it was important for Van Voorhis to get off to a fast start. “I knew I had to take off fast because everyone was going to be chasing me,” Van Voorhis said. Van Voorhis got off to a rough start in Eugene, failing to qualify for finals in the 100 after finishing 12th in 11.10 in prelims on Friday. Van Voorhis was also two spots away from reaching finals of the 200 after placing 10th in prelims in 22.22. Qualifying for finals in only the 400 also gave Van Voorhis time to rest, unlike the district meet when he ran the 100, 200, 400 and 4×400 relay.